Home Books and Accounts What are Different Types of Ledgers? A ledger is a book where all ledger accounts are maintained in a summarized way. All accounts combined together make a ledger book. Predominantly there are 3 different types of ledgers; Sales, Purchase and General ledger. A ledger is also known as the principal book of accounts and it forms a permanent record of all business transactions. First among different types of ledgers is “Sales or Debtors’ ledger”. It is a grouping of all accounts related to customers to whom goods have been sold on credit (Credit Sales). Sum of all the money owed to a business by their customers is shown here and is termed as Accounts Receivable, Trade Debtors or Sundry Debtors. The accounts are mostly arranged in an alphabetical order, however, nowadays all the ledger accounts are maintained with the help of accounting ERPs. It is a grouping of all accounts related to sellers from whom goods have been purchased on credit (Credit Purchases). Sum of all the money owed by a business to their sellers is shown here and is termed as Accounts Payable, Trade Creditors or Sundry Creditors. Total monetary amount inside the purchase ledger is shown in the trial balance and the balance sheet at its appropriate place. Cash Sales and Cash Purchases are booked into the Cash Book. Companies usually make a single general ledger which includes 2 additional subtypes of ledgers i.e. 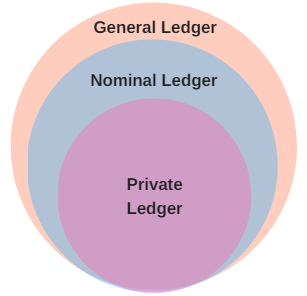 nominal ledger and private ledger. These two may or may not be included in the list for different types of ledgers in accounting. A general ledger or GL is a centralized compilation for all the ledger accounts of a business. It contains all types of accounts which can be found in an organization such as assets, liabilities, capital or equity, revenues, expenses, etc. As per traditional or UK style accounting, GL consists of all nominal & real accounts necessary to prepare financials for a company. E.g. Building, Office equipment, Furniture and so on. Nominal Ledger – As the name suggests it contains all nominal accounts i.e. expense, losses, incomes and gains. Examples – Salaries, Sales, Purchases, Returns Inward/Outward, Rent, Stationery, Insurance, Depreciation, etc. Private Ledger – Private ledger consists of accounts which are confidential in nature such as capital, drawings, salaries, etc. These accounts are only accessible by selected individuals. Some companies do make separate general, nominal and private ledger.